Jay Felger and his research assistant, Chloe, demonstrate a prototype plasma weapon, but the test goes awry, and with too many screw-ups on his record, Felger is about to be fired. In desperation, he promises that he's on the verge of a major breakthrough, and Hammond grants him 24 hours to prove it. 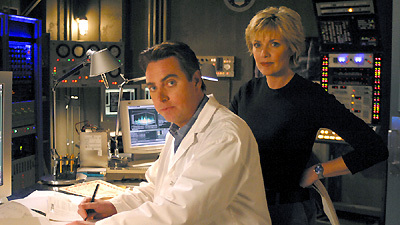 Felger has no choice but to grasp at a previously discarded idea, Avenger, a computer virus that will allow the SGC to target and disable a remote stargate. Hammond approves the project with Carter's collaboration, and Felger is ecstatic. His infatuation with Carter is so powerful he doesn't even notice Chloe's interest in him. Hammond authorizes a test of Avenger on P5S-117, a mining planet controlled by Ba'al, and at first all seems to go well. However, problems soon arise. O'Neill and Teal'c, under fire from an al'kesh on P3C-249, cannot establish an outgoing wormhole. Daniel, trapped amid rising flood waters on P3L-997, also cannot dial out. The Tok'ra report that multiple gates are shutting down. Apparently Avenger has triggered an automatic system-wide correlative update of all DHDs, and the entire gate network is soon offline. All attempts to reverse the virus's damage fail, and only Earth's dialing computer is capable of dialing out. Carter and Felger determine that their only option is to travel to Ba'al's planet and neutralize the virus at the source. On P5S-117, Felger discovers that someone, probably Ba'al, has tampered with his original program. The new virus, not Avenger, caused the gate network to shut down, but now the unexpected modifications must be neutralized as Felger and Carter come under fire from Ba'al's Jaffa. Suddenly, O'Neill and Teal'c arrive overhead in a commandeered al'kesh, and defeat the advancing Jaffa. Felger is able to redeem himself, and he successfully modifies and uploads the antivirus that restores the gate network, and his reputation, at last. The theory had been that the gate network must undergo periodic correlative updates every couple of hundred years in order to compensate for stellar drift. It is believed that the gates dial each other automatically to transmit the new coordinates that apply to each address. The random dialing of 7 symbols chosen from a pool of 38 non-repeating candidates results in about 63 billion possible combinations. The spread of Avenger 2.0 caused each DHD to be unable to establish an outgoing wormhole, although the gate could receive an incoming wormhole. The Earth gate was the only one able to dial out because it does not rely on a DHD. Avenger 2.0 was named after the Amazing Avenger, a comic book hero with green tights and a purple cape. At the moment, Ba’al has the largest fleet among the Goa’uld. With the gate system down because of Avenger, he is taking advantage of the situation, attacking the other System Lords on several fronts, and winning. In all, 15 teams had been off-world, 3 teams returned, and 12 were stranded until the gate system was back online. P5S-117 is the planet under the control of Ba’al to which the Avenger 2.0 virus was first uploaded. P3C-249 is the planet where O’Neill and Teal’c met to negotiate with Rebel Jaffa leaders. P3L-997 is the planet where Daniel attempted to relocate the inhabitants due to the decaying orbit of their moon. P4F-221 is the planet from which a mining team returned when off-world teams were being recalled. Phaser? More like a photon torpedo. Felger packs duct tape in his bag. We’re sort of like the intellectual Butch and Sundance of the SGC. Butch and Sundance got cornered and killed by the Bolivian army.